IDX, a company in Iowa City, created an instrument that the Food and Drug Administration calls a breakthrough device. 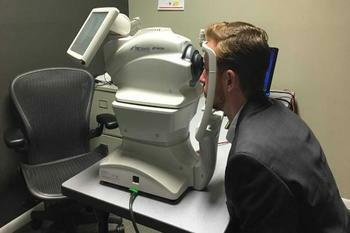 The machine can autonomously detect diabetic retinopathy by taking photos of the eye. Diabetic retinopathy is the leading cause of blindness, causing vision loss in roughly 24,000 Americans each year. Given that more than 30 million Americans have diabetes, preventing vision loss is critical. Early detection can prevent vision loss, and the IDX device can help. “I see patients who have this disease and many times it’s late, or very late, or too late, and if caught early we could do so much to prevent this,” said Dr. Abramoff, IDX President, and Founder. If you are losing your vision, SDCB can help you incorporate assistive technology into your life.